While the VAK learning style categories focus only on the external aspects of learning (auditory, visual, kinesthetic), Kolb’s learning styles include perception and processing. 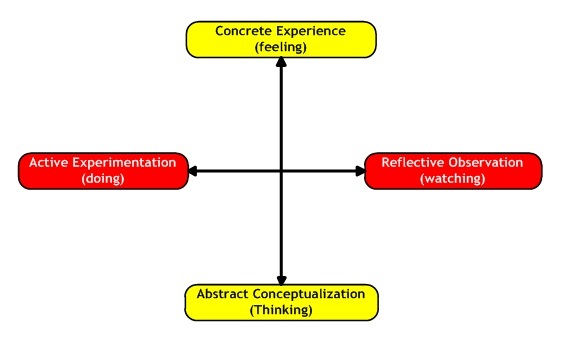 According to Kolb, learners perceive and process information in a continuum from concrete experience, reflective observation, abstract conceptualization, and active experimentation. Kolb’s learning theory sets out four distinct learning styles, which are based on a four-stage learning cycle. 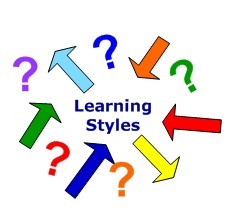 Learning styles can be viewed on a continuum across two dimensions, based on how people perceive information (concrete vs. abstract) and process information (active vs. reflective). Kolb believes that as we learn something we go through a learning cycle. That cycle begins with a concrete situation which we experience. He believes we then reflect on this experience and what it means. After we reflect on the experience, we then begin to understand what is to be learned from the experience. He suggests we then attempt to apply what we learned by creating an experiment. Although Kolb thought of the learning process as a continuum or cycle that one moves through over time, he believes people come to prefer one element or style above the others. The Kolb Learning Styles Inventory plots the degree to which the subject engages in concrete experience, active experimentation, abstract conceptualization and reflective observation. The four resultant learning-style types from the Kolb instrument are diverging, assimilating, converging and accommodating.